I've officially relocated back to the northeast for the summer to work for the U.S. 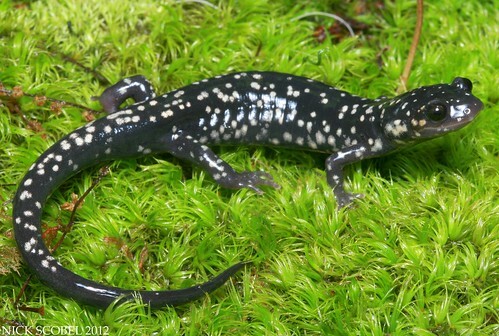 Fish & Wildlife Service on several conservation projects involving herpetofauna. My first day of field work was a gloomy one, as periodic heavy rainfall occurred for the majority of the afternoon. After my day was done, I took a short walk at an area in hopes of seeing some salamanders and I wasn't disappointed. 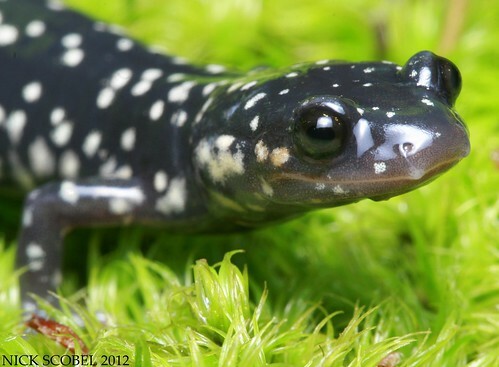 A sharp and vastly underrated species in my opinion, Northern Slimy Salamanders are one of the most recognizable salamanders in the northeastern United States. Their dark color, white spots, and extremely sticky skin secretions are good field marks for distinguishing this species from anything else. Although the weather was rainy on this particular day, the weather over the weekend was considerably nicer.I made a trek through the mountains and was rewarded with a few finds, one particular snake was a highlight. 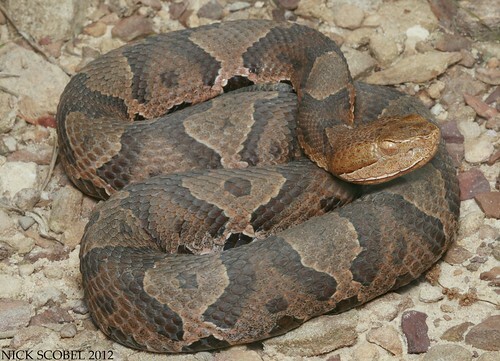 One of my favorite North American vipers, the copperhead is arguably one of the best looking snakes in the region. This individual was found on a rocky ridgetop in the early afternoon near a large boulder pile. Copperheads have a small, restricted range in New Jersey and are only found in a few small ranges in the northern part of the state, so seeing on is always exciting. Not long after, this rat snake was found coming onto the road. 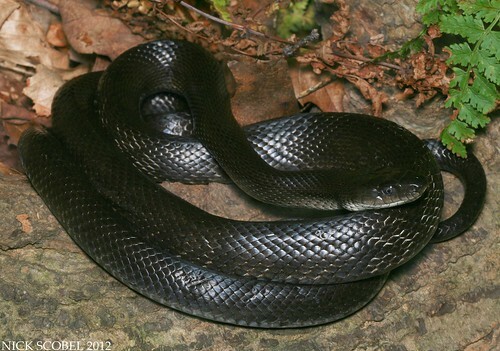 A very common denizen of woodlands in the eastern United States, Black Rat Snakes are excellent predators of small rodents. This species is found throughout most of the state from the mountains in the north to the pinelands of the south. My residence for the summer with the USFWS has its perks, including this female Spotted Turtle that I found crossing my driveway one evening this week. Spotties are a tough commodity back home in Michigan, but here in the northeast they seem to be locally common. I've seen more than a dozen in the past week either in ponds or on roads. They also seem to be less spotted than our individuals back in Michigan, maybe I'm just biased but I think Michigan spotties are much prettier. There's also a plentiful amount of these guys in the area and they have been abundant ton the roads as well. 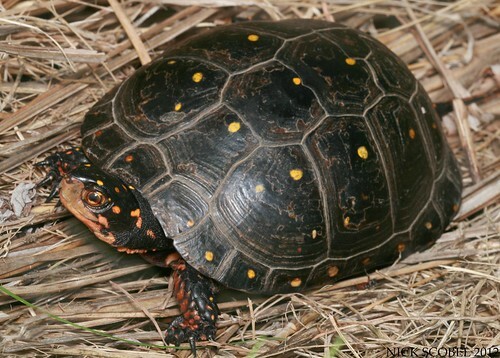 There may not be a more variable herp species in North America than the Eastern Box Turtle, with the exception of the Eastern Garter Snake. They come in a myriad of colors and patterns and are one of the more charismatic turtle species. But there's one species out here that I'm particularly fond of and have had the privilege to work with. It's a secretive turtle which inhabits places like this. Wetlands like this boggy fen with ample emergent vegetation are home to the Bog Turtle. 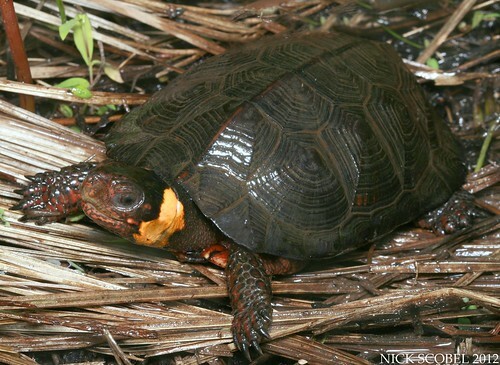 A close relative to the Wood Turtle, this species is small and extremely secretive. It requires habitats like this with slow, cold moving water via streams and seepages to survive. They can be found basking atop sedge tussocks or moving about through small meanders in the marshes, like this young male. 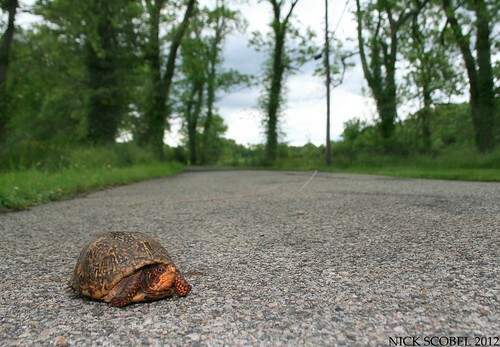 This turtle was out in the open on a warm but overcast afternoon. 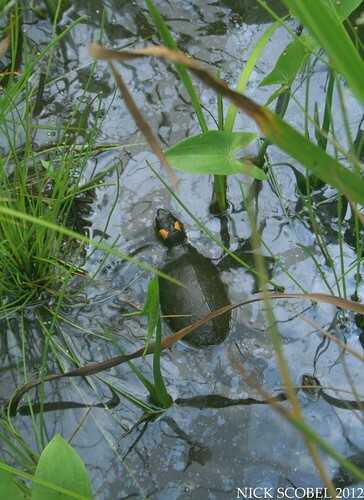 When the sun is out and temperatures rise in the summer months bog turtles often dig themselves into the mud or submerge themselves to keep cool, this makes an already secretive turtle much more difficult to find. 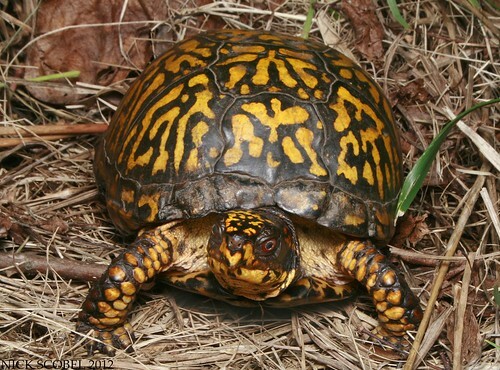 The dark, sculptured carapace and bright yellowish-orange markings on either side of the neck are good field marks for this turtle. It was once much more widespread across its range but this species has declined drastically due to habitat loss and illegal collection. It is listed as Threatened or Endangered in every state in which it is found and is listed as a Threatened species under the Endangered Species Act. Because of its federal protection by the U.S. 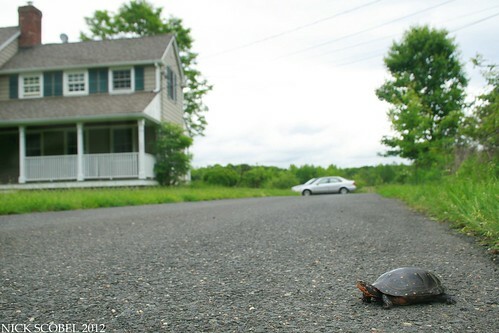 Fish & Wildlife Service, bog turtle conservation is a joint effort between the USFWS and state & private agencies such as the NJ Department of Fish & Wildlife and the Nature Conservancy. Because of these joint efforts, the Bog Turtle appears to be doing quite well in its remaining populations and its future is bright. I'm excited to once again work on some great conservation projects with this species here in the northeast. 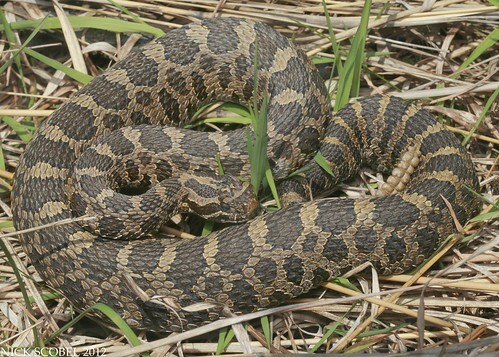 One of Michigan's largest and most beautiful snake species inhabits the once widespread coastal marshes of Lake Erie and Saginaw Bay. 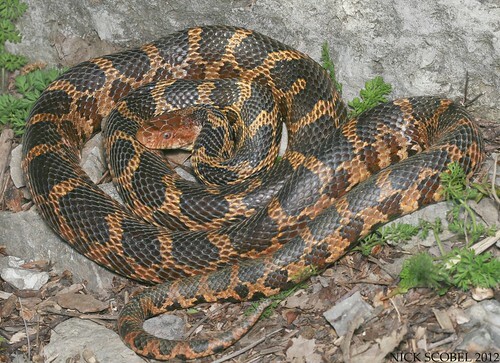 It is a large, powerful constrictor that is a member of the rat snake family and spends much of its time in pursuit of rodents, birds, and their eggs. 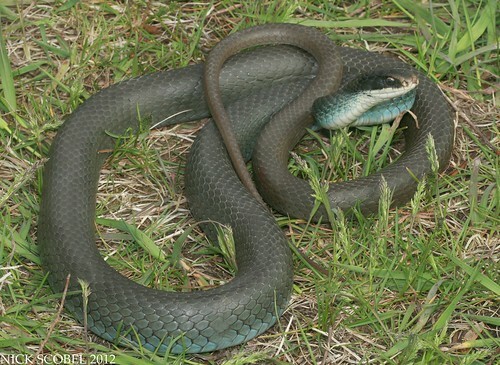 It can be hard to imagine a large rat snake species roaming habitats like the one pictured below. 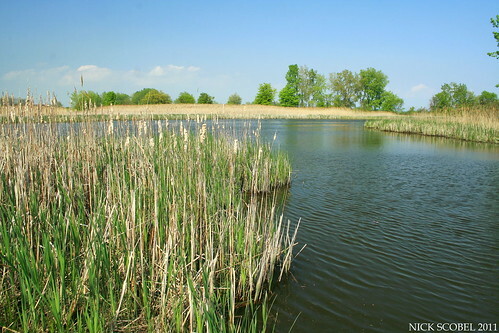 Coastal Marsh is an herbaceous wetland community occurring statewide along the shoreline of the Great Lakes and their major connecting rivers. 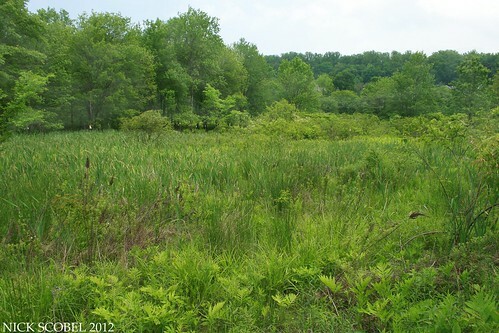 Vegetational patterns are strongly influenced by water level fluctuations and type of coastal feature, but generally include the following: a deep marsh with submerged plants; an emergent marsh of mostly narrow-leaved species; and a sedge-dominated wet meadow that is inundated by storms. Coastal Marshes provide important habitat for migrating and breeding waterfowl, shorebirds, and our snake of interest, the Eastern Fox Snake. As my time in Michigan is once again winding down before I head out east, I decided to swing down to a few sites after meeting a friend for lunch in hopes of seeing one before I depart. Less than five minutes after reaching my first location, I saw this. This was a very large female, well over four feet in length and basking right next to a man made structure. Jason Folt and I saw a bunch of neonates at this same exact spot last fall and it would indicate that the fox snakes in this area are utilizing a space under the foundation as nesting location. This big girl was extremely gravid and I could even feel the eggs along the underside of her belly. It would appear that she is hanging around the area looking for an ideal location to drop her eggs in the coming weeks. It was exciting to see one of these awesome snakes before I take off for the summer once again. Unfortunately, this species isn't doing terribly well in Michigan as much of its coastal wetland habitat has been and continues to be lost. 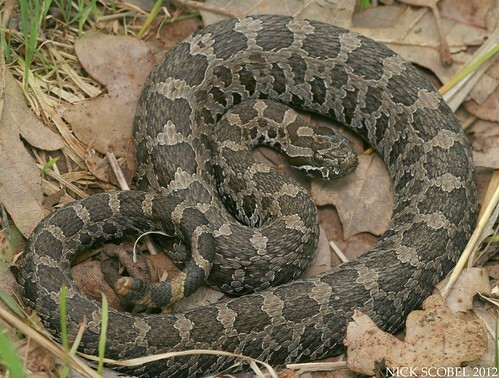 The Eastern Fox Snake is listed as a Threatened species in Michigan and any observations should be reported to the Michigan Herp Atlas. Sightings of this snake are increasingly uncommon, so if you get the opportunity to bump into the field, enjoy it from a distance. That's all for now, stay tuned for a post about when I got to go Herping with Dylan. 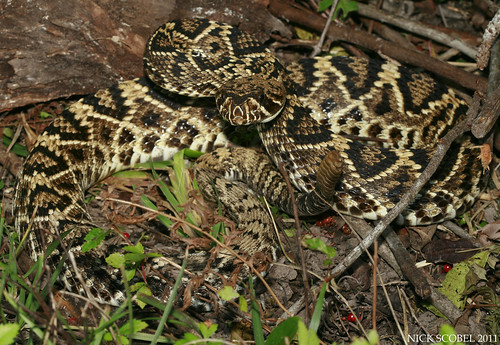 There may be light on the horizon for the largest rattlesnake species in the world, the Eastern Diamondback. The U.S. Fish & Wildlife Service announced yesterday that the snake may qualify for federal protection under the Endangered Species Act. This response occurred after a petition for the protection of the snake was submitted in late 2011 by the Center for Biological Diversity with several biologists being on board, particularly Dr. Bruce Means who was worked with the species for his entire life. You can read more about the announcement in the article posted via the U.S. Fish & Wildlife Service. 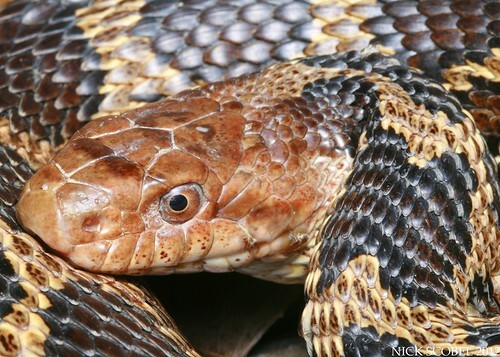 This snake has and continues to experience drastic declines across its range in the southeastern United States and none of the states in which it has found have offered it legal protection. A denizen of the longleaf pine forests of the southeast, this snake is easily one of the most impressive that is found in North America. Unfortunately, a mere 2-3% of its former habitat still exists and many of these snakes that are still hanging on today are living in an extremely fragmented landscape. This makes them extremely susceptible to road mortality and persecution by humans. Many are hit by motorists intentionally when seen crossing roads and others that are encountered in the field are usually shot or killed on sight. 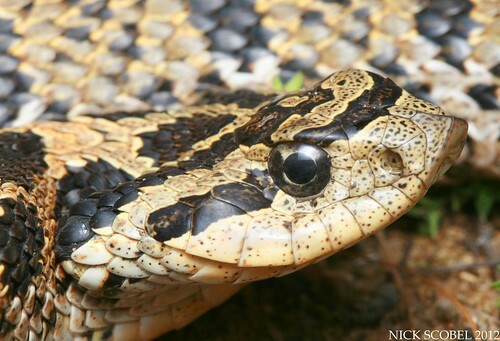 With an adult length of 4-7 feet in length they are certainly a formidable snake to meet in the field, but the Eastern Diamondback would rather get away than hold its ground and fight. Unfortunately, ignorance and old wives tales have given this snake a nasty reputation to the people who live in and around its habitat in the southeastern United States. 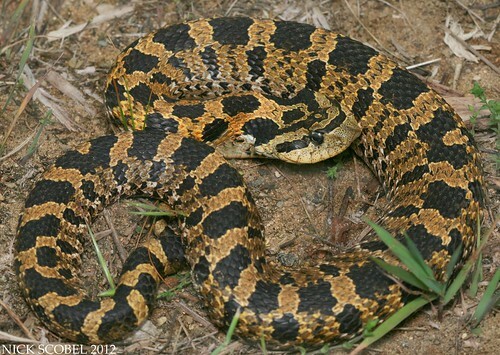 This coupled with habitat loss has caused drastic declines for this snake and it is likely extirpated in Louisiana and North Carolina where it was formerly found. 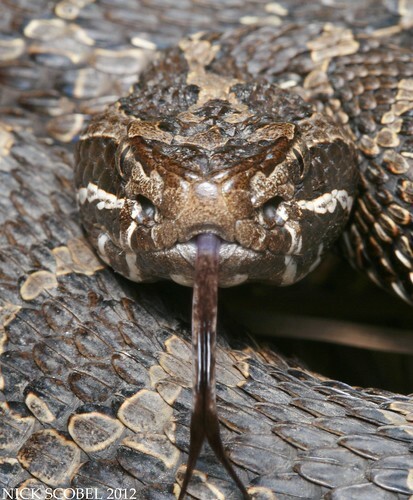 Some states such as Mississippi and Alabama still hold yearly rattlesnake roundups where snakes are collected for skins and meat every year in the hundreds. 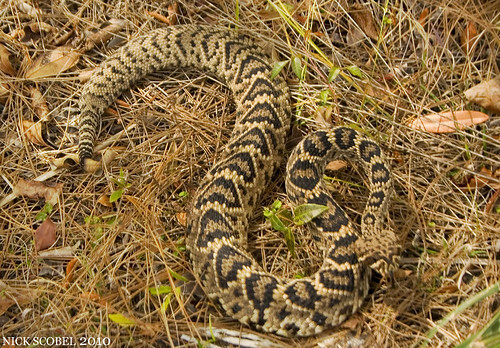 The Center for Biological Diversity and other partner organizations made a push for federal protection last last year when they submitted a large proposal and petition for the snake to be listed as threatened under the Endangered Species Act, you can read the entire petition here via the Center for Biological Diversity. 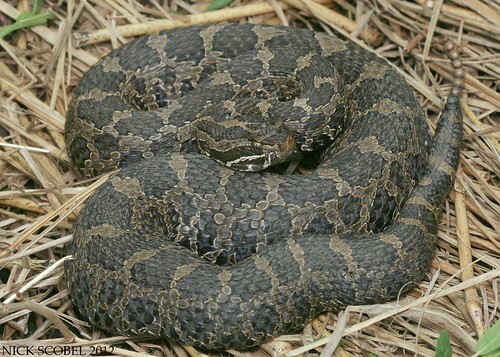 Because of the extremely conservative political cultures in Florida, Alabama, Mississippi, Georgia, and South Carolina, the snake would never be listed at the state level protection. The announcement from the USFWS yesterday is a step in the right direction in the conservation of this species. A decision must be made within a year, and hopefully the Eastern Diamondback will get some much needed help in the fight for its future, stay tuned. As I prepare to head out to the northeast for the summer once again, I've been busy in the field with some friends trying to see as many species as I can in southeast Michigan before I take off. After getting a hognose snake late last week, things were off to a good start. On Saturday, I met up with Chris & Matt Boguslawski to hop around Washtenaw County in hopes of seeing some buzztails. It's been an abnormally poor spring for me in terms of finding massasaugas, I had only seen 5 before the weekend. This is a low number for me, but most of April was fairly cool and rainy and there were very few warm days with plentiful sunshine. We met around 11:30 AM and headed out, it wasn't long before Chris got us on the board with this sharp looking juvenile. 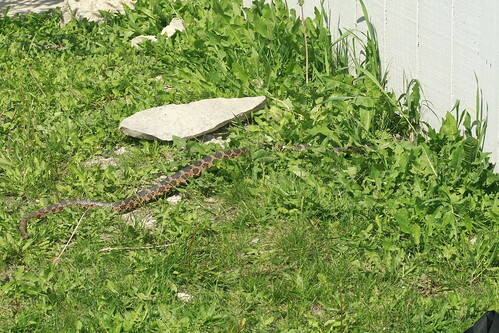 This snake was seen exactly one month after I saw my last massasauga this spring on April 4th in Oakland County and was a sharp looking snake for its size. Its small rattle was barely audible and yet it shook it almost the entire time we photographed it. It was encouraging to see one of these guys after a month long hiatus just a few minutes into our trip. We circled the area to a meadow where we have seen many massasaugas in the past, especially gravid females. We criss-crossed the field without seeing a snake, but as we were heading out I just about stepped on this big girl. It always amazes me how easy it is to walk right past this species, even when they are as conspicuous as this big snake was. We had circled past the area she was basking at likely within a few feet of her and failed to nice her right out in the open. In case this snake looks somewhat familiar to some of you, she should. I've posted photos of this particular female several times over the past few years and I've come to know her particularly well. She tends to hang out in this particular meadow for the course of the year, even when she isn't gravid as she was last year. We snapped a few photos of her and then decided to head to the western end of the county to explore some new habitat. We had made up our minds that we would simply explore state land and walk any habitat that looked good. We drove past a large open field and decided to head in. Eventually I came to this large board and decided to give it a flip. You can imagine our surprise to find three large blue racers under the same board. After a few moments of pandemonium, we had all three in hand for a few photos. The two that Chris and Matt had grabbed were fairly well behaved, while mine acted in more true racer form and whacked me repeatedly in the hands and arms. These three snakes were considerably different looking than the racers I've seen up north, or even the ones that I've seen over in Oakland County. 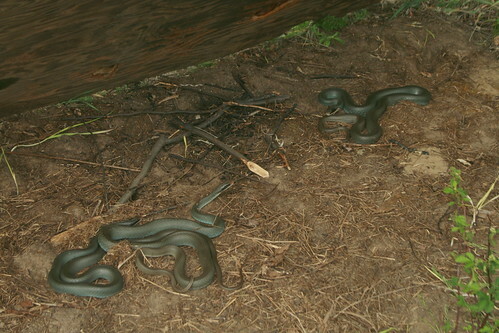 Although they displayed the characteristic blue hue along the sides and the dark head, these three snakes were very gray and tan in appearance. I found them to be quite stunning and was excited to see them still hanging on in my home county. 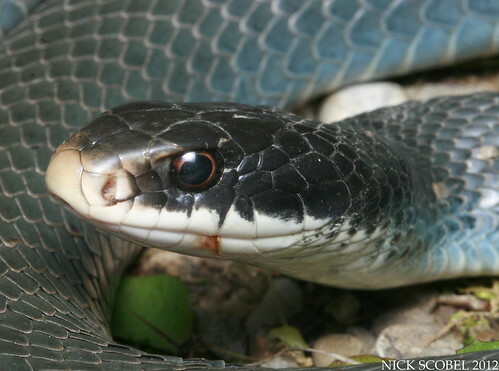 Although they are doing quite well in the western lower peninsula, blue racers seem to be struggling in the southern lower peninsula and in areas of southeast Michigan. Washtenaw county is an incredibly developed county and much of their former habitat has been reclaimed by development. It is quite common to see them dead on roads in areas in which they still inhabit and road mortality is another threat to them in this area. Later on in the day, we swung over to an area I used to frequent in hopes of finding a brown snake for Chris. 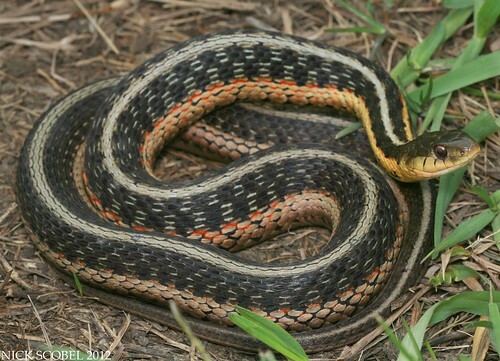 Although none were found, we did find this absolutely gorgeous garter snake. A diamond in the rough, this garter snake was a large gravid female and exhibited some eye popping colors. The bright reds along its flanks are not uncommon for this snakes at this location, but this snake was particularly exceptional. It was a nice way to end a nice day in the field with friends. On Tuesday, I finally was able to get out in the field once again with my cousin Robbie Webb. Some of my fondest memories as a kid and as I've grown have been trips in the field with him. With my school schedule and his work schedule, it has been difficult for our schedules to coincide for field time since he moved up here to Michigan. We headed up to Oakland County to meet the Boguslawski boys in hopes of seeing some rattlesnakes and getting Robbie his first blue racer. We headed to a favorite fen of ours and we split up. 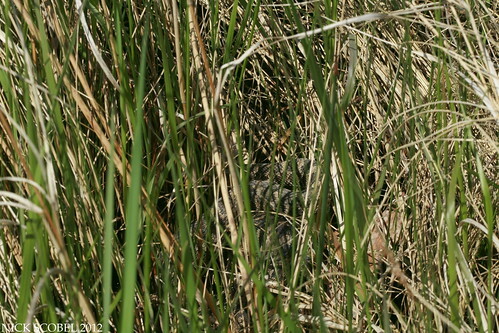 I spotted this adult massasauga basking from cover around noon. It's very evident in this photo how cryptic their patterning makes them, I could have easily walked right by this snake without even seeing it. The tan background color of the snake matches the tan color of the sedges perfectly and the blotches help break up its body image incredibly well. An exceptional looking snake in my opinion, this girl is another familiar snake. I observed her several times last year and even once last fall, when she was noticeably thin after dropping a load of neonates at some point last summer. She was noticeably stouter this spring and seems to have put some weight back on and even had evidence of a food bolus in her on this particular afternoon. 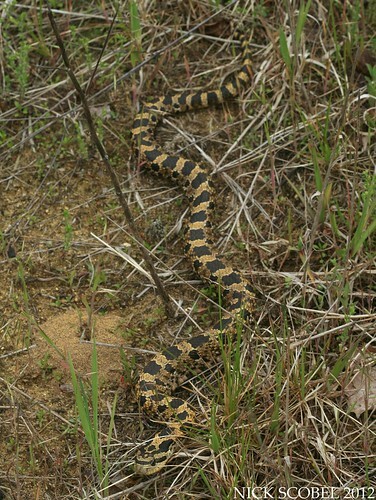 This was the only massasauga that we saw, despite the nice weather. Not long after, we moved out of the fen to an open field with some brush piles. 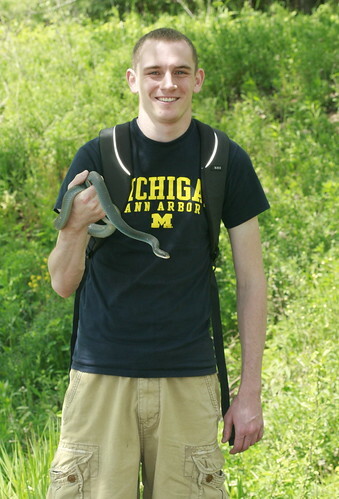 After a few minutes we had Robbie's lifer blue racer in hand. 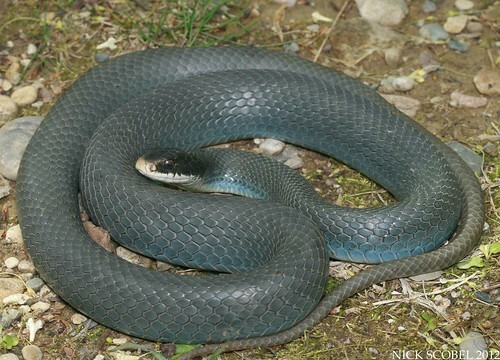 As you can see, blue racers from this population are considerably different looking than the snakes seen in Washtenaw county earlier in the post. 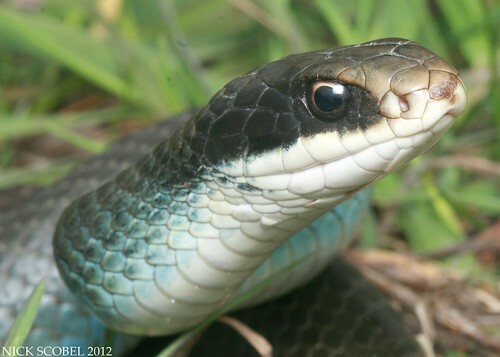 Blue racers are a fairly variable species, so its not a surprise that we can see phenotypic variation between two separate populations. It was fun to get out in the field with Robbie again and be able to get him his lifer. I can only hope there won't be such a long hiatus between this trip and the next time we get in the field together. Of all the snake species I've seen in Michigan, I would say the toughest to find is the Eastern Hognose Snake (excluding Kirtland's & Copperbelly Water Snakes). 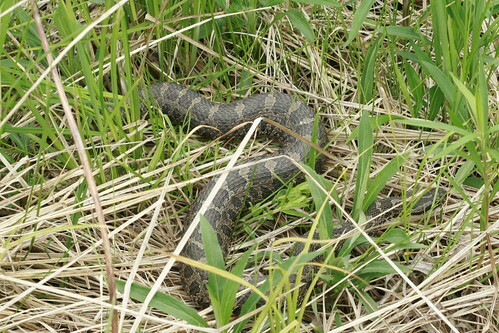 They are a supposedly a common snake species throughout the lower peninsula where sandy soils abound, particularly the northern & western portions. However, they are quite secretive and spend much of their time burrowing in these sandy substrates in search of cover and food. This makes them particularly difficult to find as they are not always active on the surface. Although they are more commonly found elsewhere in the state, there are some pockets of nice habitat in southeast Michigan. Last year, I had the privilege of exploring some really nice habitat on private property of some friends not too far from my place in southeast Michigan. I also got the chance to get out there a few days ago and was rewarded with this sight. A beautiful golden yellow adult, easily the nicest looking example of the species I've seen. Hogs are extremely variable in coloration, with some individuals even being completely gray or black with little to no patterning. This is only the sixth live specimen I've seen in my lifetime, and my first of the year. It was found in an open field with sparse cover and plenty of open sandy soil which is adjacent to a large tract of Oak-Pine forest. The upturned rostral scale where this species gets its namesake from is easily seen in the photo above. Hogs use this adaptive trait to burrow into the sandy soils of the areas the inhabit. 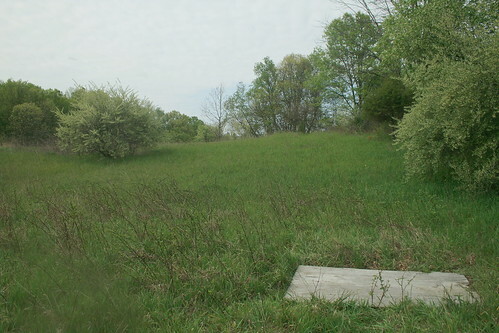 This could be in search of shelter, food, or to excavate a chamber for eggs. Females generally do this in early or mid June and the young usually hatch out in August or September. I've written before about their impressive defensive displays which entail a flattened neck and high pitched hiss, so I've decided to attach a video of this behavior. This snake was a little unwilling to play dead as much as other hogs I've seen, but it did eventually do so. It is always a treat to find this species in the field as I don't see them very often. I'll close with another short video of this beauty disappearing into the field, I can only hope I'll see one again before the year is over.